I plan to put my Christmas tree up this weekend, which will be a week earlier than I did last year (*pats self on back*). So in my house, it'll begin to feel like Christmas. Where it already feels--and looks--like the holiday, however, is at Charlotte Motor Speedway. 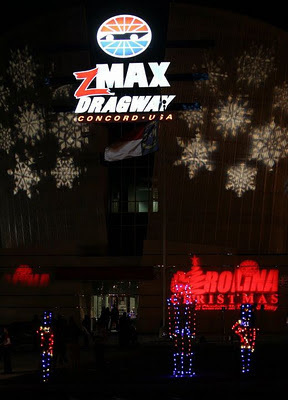 The second annual Carolina Christmas display, featuring more than 3 million lights, a Bethlehem Village with a live nativity scene, pony rides for kids and a petting zoo, local food vendors, and more, is open at the speedway through December 31. Click here to read my review at CharlotteMagazine.com, which I wrote after visiting Carolina Christmas during its opening weekend. This Friday night, December 9, Carolina Christmas will feature an old-fashioned drive-in movie with a modern twist when it shows Polar Express on the world’s largest high-definition television screen at Charlotte Motor Speedway. The movie will begin at 8 p.m. and is included with regular admission to Carolina Christmas that night. Click here for more details on the movie night.